Choose video file stored on your computer that you wish to stream live to social media platforms. Set the time of your choice, when you wish your video live stream to start automatically. Select Facebook Pages & Groups, YouTube or Periscope Channels, where you wish your video to GO LIVE. Relax. All the transcoding, processing and live streaming will be handled by OneStream automatically. Have a look at OneStream Knowledge base for frequently asked questions. Email or chat with us live to know anything! Gain detailed insights to your live streams performance and user engagement. Using Custom URL and Key, schedule & stream to any live streaming destination. 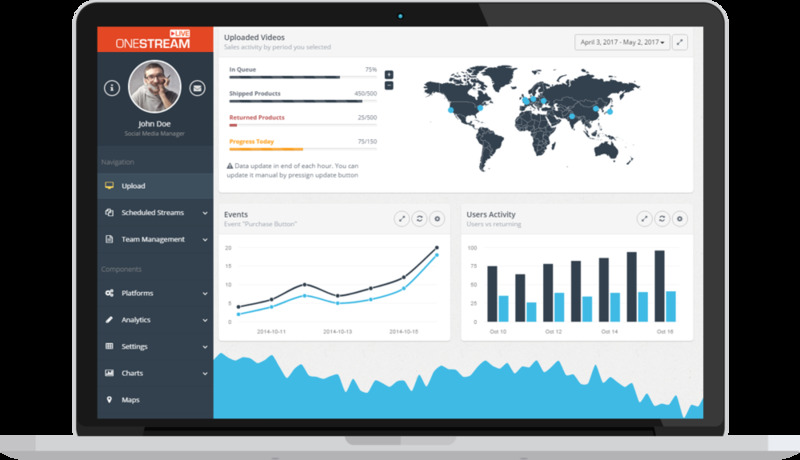 OneStream's powerful dashboard allows you to manage all your streams from one place. OneStream's affiliate program shares 15% recurring revenue for every paid subscriber referred by you.